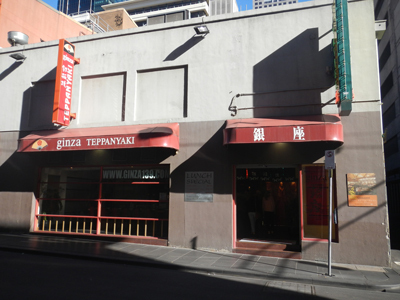 If you're looking for a unique dining experience in Melbourne, and don't mind spending a little bit of money, you need look no further than Ginza Teppanyaki. 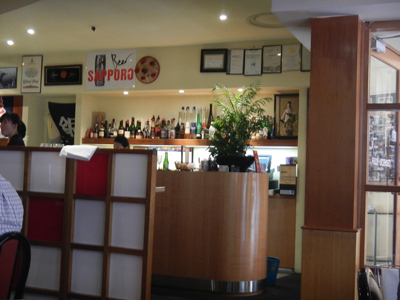 Located in Little Bourke Street- in the heart of Chinatown- this traditional Japanese restaurant ticks all the right boxes for dining, hospitality and entertainment. 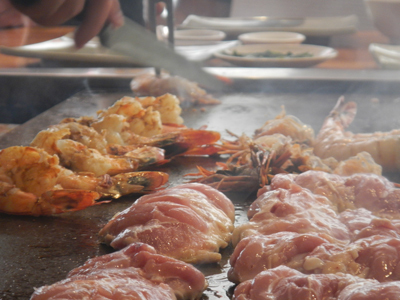 Now, if you've never had Teppanyaki before, there are probably a few things that you need to familiarise yourself with. First of all, Teppanyaki is essentially a Japanese barbecue style- where a skilled chef cooks your meal on a large hotplate in front of you and your fellow diners. The hotplate is built into the table that you and the other guests are seated around, allowing you to see every move that the chef makes as he (and it usually is a 'he') cooks up the seafood, meat, rice and other goodies that are included in the banquet that you have chosen. The other thing that you have to note is that Teppanyaki is usually considered to be quite a theatrical affair, which means that you most likely will have a dining experience that matches no other. Audience (meaning diner) participation in most of these theatrics is encouraged, and certainly livens up the meal. It also helps to create a bond with your fellow diners, who you may not have known before you joined the table. 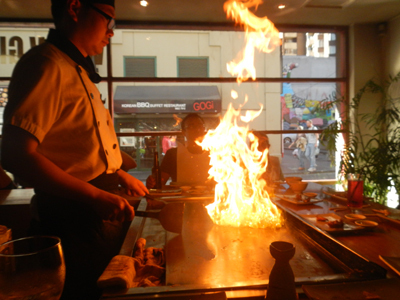 Ginza Teppanyaki has all the elements of a traditional Japanese restaurant, with a lovely Oriental-themed interior. Featuring a maroon, walnut and white colour palate, and splashed with hints of greenery (in the plants that sit randomly around the large room), the place elicits a calming atmosphere, which is intermittently dashed by a burst of flame from one of the Teppanyaki theatrics (which will be visited later). 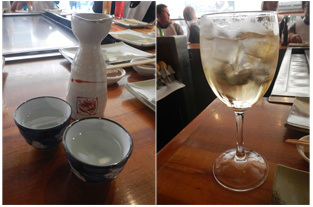 Despite the relatively soothing ambience, the restaurant is a family-friendly establishment, with children well-catered for by the hostesses (who are dressed impeccably in pretty Kimono-style uniforms). The hostesses are just as accommodating to the adults at the tables, always ready to assist with getting drinks from the well-stocked bar, and diligently cleaning up the mess when some of the theatrics get out of hand. 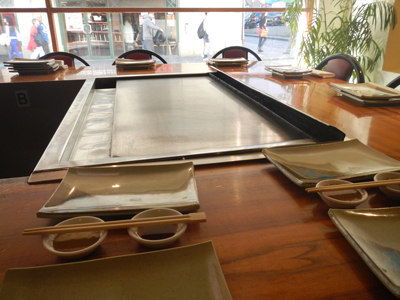 There are several Teppanyaki set menus that you can choose from for your meal, with the cheapest one beginning at $45 per head. The more you pay, the more food you get, although I have found that the cheapest set provides more than enough food to keep you full and satisfied. After you have chosen your menu, the hostesses provide you with a paper bib, which they tie around your neck in preparation for your meal. Although they look ridiculous, you will come to appreciate them as the meal progresses. The bibs also provide an indicator to your chef about which menu you have chosen, so that he can cook the food accordingly. As the chef begins to prepare the hotplate, you are served a small plate of salad (spinach with mustard, which really burns the sinuses if you eat too much at once), and a small bowl of miso soup. 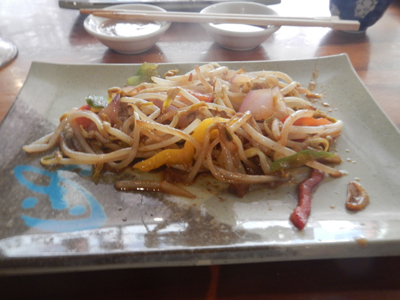 You can enjoy these plates while watching the chef cook up the prawns and marinated chicken pieces in front of you. After you have eaten this (it's optional whether you want to eat the prawn legs too- only one person on our table dared to), the chef prepares some bean shoots and other vegetables cooked in a tasty sauce and begins the theatrics with some eggs. Whisking the eggs and cooking them on the hotplate so that they resemble a long omelette, he chops the cooked egg strip up and literally tosses pieces of it at each person until they catch it in their mouth. One lucky person is then selected by the chef to receive a seemingly endless barrage of egg flung at them- luckily for us there were some kids on our table who were more than up to the task. After this messy encounter is finished, the chef tones it down (slightly) for the cooking of the beef. While the hostesses clean up the egg around us, the chef turns up the gas and splashes fluid onto the hotplate. This results in a fantastic display of heat and flame, which engulfs the marinated beef and turns its browning into quite a show. After it's cooked, the meat is so tender and juicy that it really doesn't need the satay sauce that is provided for dipping. 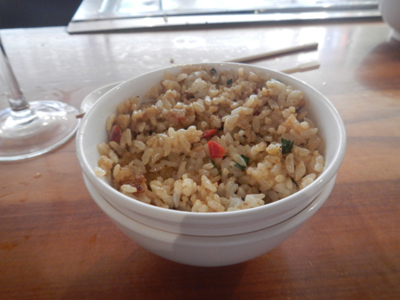 With the main parts of the meal now complete, the chef is ready for the grand finale- the fried rice. After he has mixed together all of the pre-prepared ingredients and cooked it to perfection, he grabs a small stack of white plastic bowls and hands one to the person sitting on the end of his table. He then methodically tosses a stack of bowls one by one, which that person has to catch with the bowl that they were given. After working his way around the table (so that every person has had a go), the chef then ups the ante, moving his way around the table yet again, but this time tossing a full bowl of fried rice, so that you have to catch it if you want to eat it! This is actually an easier task than it looks (luckily, for the uncoordinated amongst us) and provides an interesting ending to an enjoyable meal. You would think that for all the theatrics involved in most Teppanyaki meals, the actual food would be lacklustre in taste and appeal, but this is not the case. All of the food is delicious and fresh, and there is a vast drinks selection available from the bar which perfectly complements any of the food that you choose to eat. 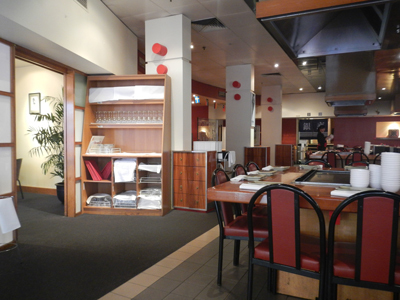 Ginza boasts at least 6 Teppanyaki tables (which can seat approximately 16 people each) and also has a function room for private parties. They also pride themselves on the many notable people that have walked through their doors over the years- a photo-board just inside the door of the restaurant features group shots that include the likes of Jimmy Barnes, Red Symons and former Melbourne Lord Mayor John So. Ginza Teppanyaki is by no means the provider of a cheap meal, but they more than make up for it with friendly staff, tasty food and a wonderfully unique experience. I highly recommend you book a table and enjoy a night there on your next trip into Melbourne.